Google patents sticky layer tech to lessen pedestrian injuries in case of impact. Images courtesy U.S. Patent Office. Flypaper is the analogy that Ethan Baron is making to a new Google patent for technology that would boost the safety of pedestrians who might be hit by self-driving vehicles. 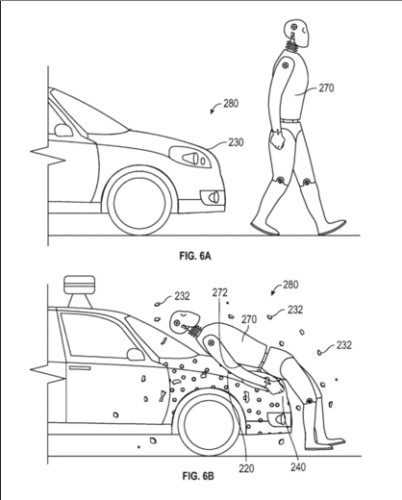 Writing for The Mercury News, Baron reports that the large tech company received a patent earlier this week that describes a sticky layer that could be applied to such vehicles as a way to lessen the injuries if an autonomous vehicle collided with a pedestrian. Ideally, the adhesive coating on the front portion of the vehicle may be activated on contact and will be able to adhere to the pedestrian nearly instantaneously. The hope is that this mmay help to constrain the movement of the pedestrian, who may be carried on the front end of the vehicle until the driver (or the car itself, if it’s self-driving) has a chance to hit the brakes. Although the patent says the technology is directed towards self-driving vehicles, in theory it could be applied to other vehicles as well. Google did not respond to The Guardian’s request for a timeline for when this technology will be in vehicles that are on the market. But Google told The Mercury News that just because Google holds a patent on this idea does not necessarily mean it will come to fruition. That newspaper quotes Stanford School of Law professor Bryant Walker Smith, an expert on self-driving technology, as applauding Google for considering the safety of people who are outside of a vehicle. But despite the good intentions of safety technology, it does sometimes cause unfortunate unintended consequences, Smith said. As an example, he said if a pedestrian was hit by a vehicle and then stuck to it, if that vehicle then crashed into something else, the pedestrian might suffer greater injuries than if he or she had been thrown to the side of the road. The history of progress is replacing one set of problems with another set of problems and just really hoping that your new set of problems in aggregate is less than your original problem. Two major carmakers previously introduced technology to help diminish injuries to pedestrians hit by cars. Some Jaguars in Europe have the ability to elevate a car’s hood a few inches if the vehicle collides with a person, which softens the impact. And Volvo’s V40 features a pedestrian air bag, which inflates outside the car at the base of the windshield if the car hits a pedestrian. It’s designed to prevent of lessen head injuries of accident victims who land on a car’s hood. Tobias Fischer, one of the commenters responding to The Mercury News article, ponders how the sticky layer might work when a car is covered by snow or other substances. And a commenter named “Like” speculates that a pedestrian hit by a car with such a sticky-layer could be “tossed away” in the impact after his clothing is stuck to the vehicle.